I have been waiting a long time for this movie. The trailers started running in theaters many months before the movie came out, and I knew right away that "The Core" was ripe for a BA review. I remember distinctly that one line in the trailer said that the reversal of the Earth's magnetic field wipes out all life every 700,000 years. Um. If that's true, then why are we here? Life's been around for a few billion years! The trailers changed as the script was revised and scenes reshot. The end product, as we are assured from the director, the writer, and even various reviewers, is pretty accurate. Perhaps I saw a different movie. Yeah, the science of the movie was pretty bad. No shocker there, and in a moment I'll go into detail. The movie itself wasn't terrible. It just wasn't great. The characters aren't nearly as bad as I thought they'd be; in particular, a vain and overstuffed scientist (clearly based on a very exaggerated Carl Sagan, right down to the clothes) turns out to be not nearly as annoying as I expected. The lead hunky-guy-scientist actually has a decent sense of humor, and had me laughing a lot in the movie. The special effects would have been ground-breaking ten years ago, but are ho-hum now; just about every science-fiction movie coming out these days has comparable effects, and I think the effects on "Enterprise" are better! The pacing was erratic, with sudden jumps followed by dragging scenes. A lot of the movie was telegraphed. The death of the commander was so obvious from the very first five minutes of the movie that he should have had a toe tag sticking out of his shoe in his first scene. Still and all, as long as there are copies of "Armageddon" intact, no worse scifi movie will ever be made. This movie is probably a good renter; I prefer to see big action movies in the theater, but the effects in "The Core" just don't quite cut it. And what the effects depict, well, let's get to the science, shall we? We see the Space Shuttle in orbit. Small jets fire to turn it around to the correct position for landing. Pilot Major Rebecca "Beck" Childs wants to land it, but the Commander tells her that "the commander lands the bird". But there's a problem: in a dramatic series of scenes, a failure in the ground tracking information puts the Space Shuttle off-course as it lands. They have to land in downtown Los Angeles! They fly over the Dodgers stadium, and we hear the sonic booms from the Shuttle as it passes overhead. They wind up landing in the extensive LA drainage basins. There was some good stuff in that scene. The commander does land the Shuttle, not the pilot. This scene makes it clear that at some point in the movie, the commander will die and Beck will have to take over and make the tough decisions, which of course is exactly what happens. There were problems, though. In the movie, when the jets (called the reaction control system) fire in orbit, the Shuttle spins like a car going around a turn! It doesn't move that quickly in real life. The rockets don't apply all that much thrust, so that the astronauts can control the turn better. That's a Hollywood compromise, of course: I don't want to sit and watch the Shuttle taking several minutes to come about! From what I can find in the Shuttle reference manual (linked above), the rate of rotation about an axis is from 1 to as much as 7 degrees per second, so it would take from 20 second to nearly two minutes to rotate the Shuttle 180 degrees. I know this sounds nitpicky of me, but there are UFO people who claim that there are UFOs seen in Shuttle footage. What they are actually seeing is ice and debris near the orbiter, which gets blown around by the RCS units. One UFO proponent says that's silly, because the rockets are powerful and the Shuttle would move noticeably if the rockets fire. But in reality (with which this guy seems to have lost touch) the RCS units are pretty gentle. Ron Parise, a Shuttle astronaut, says that you can hear them firing (it sounds like a clunk) but you can hardly feel them when they are in automatic attitude control. So I am making the point that Shuttle maneuvers are generally pretty subtle. Finally for that scene, the sonic booms heard do happen on the Shuttle; they are the shockwaves from the nose and tail of the Shuttle. However, they only happen when the Shuttle is moving faster than sound. By the time it's at a few hundred meters height like in that scene, it's traveling well under Mach 1, so there would be no sonic boom. Oh, one more thing: if the Shuttle were off course by 130 miles, NASA would have known about it long before the Shuttle was already in the atmosphere. It was a faulty ground transponder (or some such line in the movie) that caused the problem, but the position of the Shuttle is determined in several ways, not just one. Still, it was an amusing scene, though touched with a bit of sadness given recent events with Columbia. In some ways, I suppose, it could be interpreted as a tribute to the astronauts. So what's the premise of the movie? The Earth's magnetic field is collapsing, and the field is what's protecting us from deadly cosmic rays and microwave radiation from space. Close, but no cigar. The Earth's magnetic field does indeed protect us from cosmic rays, or at least some forms of them. "Cosmic rays" is a catch-all term for any kind of high-energy particle whizzing around in space. A fast proton is a cosmic ray, as is a helium nucleus (two protons and two neutrons, sometimes called an alpha particle). The Sun emits these particles as part of the solar wind (there are other sources as well, from outside the solar system). They hit the Earth's magnetic field, and in a complicated process they eventually slam into our atmosphere. If there are enough of these particles hitting us, like after a flare from the Sun, then we can get an aurora. A big dose of cosmic rays would be bad, but not deadly, because the atmosphere would block most of them, just as it does now. I also doubt that a bigger influx of cosmic rays would cause "superstorms" as they did in the movie, too. I have read that storms may be affected by cosmic rays, but this research is pretty tenuous; more of an idea than an actual hypothesis. So cosmic rays are fairly safe. But in the movie, it's the deadly microwaves that are the problem. The real problem, at least for the movie, is that the microwaves aren't deadly. They aren't even annoying. Microwaves are electromagnetic radiation; that is, light. They have a lower energy than the light we see by, and in fact are not terribly different from radio waves. They can heat metal and food, because water and certain metals absorb microwaves pretty well. When you use your microwave oven to cook food, you are actually heating the water in the food, which is what really does the cooking. The microwaves also need to be pretty well focused to be usable for cooking. But that's the problem! Well, two problems: Microwaves are unaffected by magnetic fields, and the microwaves from space are far, far too weak to affect us on the ground. Charged particles, like protons and electrons, are strongly affected by the Earth's magnetic field, but microwaves are not charged particles! They zip right through a magnetic field without even breaking a sweat. Why is the Earth's magnetic field collapsing? Because the iron core of the planet has stopped rotating. Oh, yikes. That's just plain old silly. They say it themselves in the movie: it's a ball of iron the size of Mars spinning at 1000 miles per hour (in the picture on the left (from http://zebu.uoregon.edu/1996/ph123/l11.html), the inner core is the red sphere, and the outer core the yellow one; the brownish stuff is the Earth's mantle, and the crust is the thin reddish-purple layer on the outside). It takes a lot of energy to stop a ball that size and that mass spinning that quickly. In fact, the spinning core (if I have done my math correctly) has about 1035 ergs of energy stored up in its rotation, or about the amount of energy the Sun emits in 100 seconds. That's a whole lot of energy. If it doesn't sound like much, let's convert it to megatons: it's the equivalent energy of five trillion one megaton bombs going off. That is comfortably more than the entire arsenal of the planet; in fact, it's about 500 million times the explosive energy of every single nuclear weapon on the Earth (my thanks to regular reader and Bad Astronomy Bulletin Board member Bob Johnston for correcting me on my estimate of the total yield of the global nuclear arsenal). If the core were to stop rotating, all that energy would have to go somewhere, and where it would go is into the surrounding mantle. Again, if I have done my math correctly, that's enough energy to vaporize all the oceans on the Earth, ten times over. I guess the microwaves would be the least of our worries. The point here is that something with that much rotational energy can't just stop. Period. Now, what's ironic here is that the writers didn't need to have the core stop. How, you ask? Again, in the movie, they got something right: they said that a spinning ball of hot metal will create a magnetic field. This is a very basic property of magnetism: it's caused by moving charges. An electron zipping past you has a magnetic field associated with it, because it is charged and moving. The core of the Earth is tremendously hot, so hot that the electrons in the iron have been stripped from the nuclei of the atoms. Since it's spinning, the charges are moving, so you get a magnetic field. The real situation is far more complicated, as life, in general, is messier than an oversimplified movie review. The Earth's core isn't just spinning; there are currents inside it, and other factors which influence the Earth's magnetic field. If the writers had been clever, instead of saying the Earth's core had stopped, they could have said that the currents of molten and ionized iron inside the core had become chaotic. It takes a relatively stable flow to make a magnetic field, so the chaotic motion could collapse the Earth's magnetic field. Not only is this plausible, it appears to be true: the magnetic field of the Earth is not constant. In fact, for reasons still not well-understood, the magnetic polarity of the field sometimes reverses, with the north magnetic pole becoming the south, and vice-versa. This happens every few hundreds of thousands of years (and note that the Earth's surface doesn't boil when the field drops to zero during a reversal!). So they really blew it in the movie; they could have used real science to collapse the magnetic field, instead of the silliness of stopping the core. And even if the core stops, and the magnetic field collapses, the effects wouldn't be anything like what was shown in the movie! Oh, and by the way, that "1000 miles per hour" line in the movie is wrong too. The outer core is about 2200 miles in radius, and spins once a day. That means the outer edge at the equator has a velocity of roughly 550 miles per hour. Just picking nits while I'm here. The ship slams into a giant geode, and snags itself on a giant crystal of amethyst. The crew put on suits, go outside, and free the ship. They are deep inside the Earth's mantle when this happens. The pressure of all the mass above them would be huge; they say in the movie that it's about 800,000 pounds per square inch, or more than 50,000 times the atmospheric pressure at sea level. Needless to say, that's a lot. I have a real problem with a suit that can not only take that kind of pressure, but actually able to resist it enough to move. Sure, it's Hollywood science, and I accept that for the sake of the plot (really! ), but I just wanted to point this out. Also, that they were in a huge geode, which was pretty silly too. New! Added June 20, 2003: I don't have any other source for this, but the writer of The Core himself says geodes this big are possible. Warning: that link has plenty of explicit language. Not for the faint of heart. Incidentally, it was in this scene that the Commander gets it. A crack in the top of the geode lets in magma, which falls on his head, burns through his suit and kills him. He falls backward and sinks into the pool of magma. But he wouldn't sink! Objects sink in liquid if they are denser than that liquid. Rocks sink in water, a cork floats. A human is roughly as dense as water, but liquid rock is far denser than water. A person in a spacesuit might sink in water, but would be far less dense than rock. So in reality the Commander would float in the pool of liquid rock, and not sink dramatically, slowly sliding out of sight under the sad gaze of the hunky hero scientist guy. My thanks to David Seidel of JPL for pointing out this to me; boy, did I feel dense for missing this! A microwave beam from space breaks through the weakened magnetic field of the Earth! It happens, of course, right over San Francisco. The beam destroys the central span of the Golden Gate Bridge. Afterwards, we see the south tower of the bridge leaning toward the north. I happen to live not too far from the Golden Gate Bridge, and it's a poorly kept secret that Northern Californians and Southern Californians have some sort of feud going on that recent transplants like me don't really get (I think all Californians are nuts). This scene couldn't have helped. It's also wrong. A suspension bridge is actually pretty simple in theory. In this case, there are two towers. Cables are anchored on the shoreline and pass over the towers, going through loops at the top ( here is a great diagram showing all this). The towers support the cable. From these cables are hung hangers (also called stringers) which support the deck, or roadway. The main cables apply an upward force to the hangers through tension. Tension keeps the cables taut, and is essentially a force to the sides, pointing toward the shoreline. Think of it this way: imagine you and a friend, holding each end of a rope. I then hang a heavy weight from that rope. You both apply a force to the rope that holds up the weight. You are pulling outward, away from each other, which supplies tension to the rope, which holds up the weight. The bridge is doing the same thing. The two main cables hold up the road by applying a force outward. Now, imagine that I take a pair of scissors, and cut the rope between you and your friend. Which direction will you fall? You'll fall outward, away from your friend (as he will fall away from you), because that's the direction you are pulling. Get it? In the movie, when the main span broke, the cables would suddenly feel a huge force to the sides with no opposing force from the road. They would snap outwards, violently. They might pass through the tower loops without damaging the tower, though I suspect they might actually bend the towers. But the towers would bend outwards in that case, not inwards as depicted in the movie. Also, with the cables snapped, the entire deck would collapse, not just the middle span. I'll admit, I probably wouldn't have caught this myself, but someone on a bulletin board mentioned it. Now I can't find the link. Figures. Anyway, I saw the movie in a theater not an hour's drive from the bridge. After the bridge collapsed in the movie, I scanned the theater crowd. A bunch of people leaned over to say something to whoever was next to them, but no one laughed out loud or yelled or anything. Californians are nuts. New (added June 20, 2003): Somehow I missed this when I saw the movie, but several people emailed me about the end of the movie. The surviving terranauts are returning back up, and someone on the surface says they are coming up "at a space between two ocean plates." Unfortunately, Hawaii is located in the middle of the Pacific tectonic plate, thousands of kilometers from the edge. Generally, the boundaries between plates are where you see lots of volcanoes and such, so this mistake is understandable. Hawaii's volcanoes (and the Canary Islands, for that matter) have a different source; they are caused by a relatively stable plume of very hot magma which rises from deep inside the Earth and punches through the crust. As the plate drifts, the plume moves relative to the plate, and you get a chain of volcanic islands. If the terranauts came up near Hawaii expecting to squeeze through a gap in the plates, they'd find instead a very thick and very hard layer of crust blocking their way up. Bummer. They break into a geode. It's hundreds of meters across; how would it form against such huge pressure? And when they break into it, why didn't it immediately fill with magma, which would pour in due to the incredible pressure? Instead, it gets a slow leak, giving them minutes to escape. How does a ship communicate with the surface through thousands of kilometers of molten rock? And speaking of which, whenever there is a problem in space, the very first thing an astronaut does is call Houston. Why didn't Beck, a trained astronaut, ever ask mission control for help as things fell apart? They mention that the whole problem is kept secret from the public, and say the anomalies are caused by an "orbital wobble". 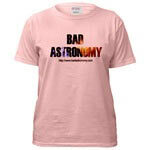 No astronomer would sit still for that! Something that big would be pretty obvious to spot, and every astronomer on the planet would know that was a lie. When the computer hacker releases the information about the project to the world, his computer screen says the information is "on it's way". Aarg! The correct spelling is "its", with no apostrophe. This drives me nuts. And knowing how ironic my life is, I have little doubt I have misspelled it in this page somewhere as well. The lead scientist in the movie pronounces it "nuke-you-lar". To be fair, I know of a very smart astrophysicist who does too. So does our current President, though that may not be a fair comparison. They say the deepest hole ever dug was 7 miles deep. That's right: The deepest hole ever dug is the Kola Superdeep Borehole, a Russian project that was to, well, dig a really deep hole. The borehole, started in 1970, extends down to a depth of 12.26 kilometers, a staggering amount, really. A similar project done by the Americans (dubbed the Mohole project, a pun on the Mohorovicic layer, a discontinuity between the Earth's crust and mantle) never got anywhere near that deep. The Americans cleverly started under the ocean floor, where the crust is thinnest. However, they not so cleverly dug a very deep hole politically getting the project together, and the real hole only went down 200 meters or so beneath the ocean sediment before Congress discontinued the budget. They show killer whales off the coast of Hawaii. I figured that must be wrong, but it turns out they do turn up off the 50th state's coastline. The lead scientist uses a peach as a model of the Earth. That's actually not a bad analogy. The skin of a peach is very thin in comparison to the total radius, as the crust of the Earth is to its radius. The meat of the peach is about the right proportion for the mantle, and the pit is about right for the core. "The Core" is not a bad movie; in fact, a lot of it was really fun. The science was not great, though some of it was pretty good. Too bad they blew it totally with the core stopping nonsense. But there is a point I want to make: the magnetic field reversal is real, and does happen every few hundred thousand years, give or take. Now, some of you may be familiar with some woowoos claiming that a big planet (called, creatively, Planet X) is supposed to pass the Earth in May of 2003 (or, for those trying to milk the situation for longer to make more money off it, Sometime In The Near Future). If you are not familiar with this silly idea, I have a whole set of pages about it. One of the things these people claim is that the passage of PX will cause a "pole shift" on the Earth. If you read their websites carefully (and take plenty of aspirin; you'll need it), you'll discover that most, if not all of them don't really say if the Earth's magnetic field will flip, or if the physical spin axis will flip. They seem to mix these two things up constantly. But they are two different things! As I said, the magnetic field does flip, naturally and explicably, every few hundred millennia. The spin axis, as far as we know, has never flipped. I think I know what's flipped, and it ain't the Earth's axis. Okay, another comment. For some reason, Corey Powell of Discover Magazine gave the movie a lot more credit than I think it should get in his review of it. That's okay; people are allowed to disagree (and his review of "Signs" was great). The movie was fun, but the science was wrong. Corey also mentions a guy by the name of J. Marvin Herndon, who says that the core of the Earth is a giant nuclear reactor. Let's just say that this theory may not be held in much regard by most geologists. Actually, I'll say more than that: Judging from his replies to some letters to the editor, the guy is way, way off base. He says that it's possible that nuclear fusion in the cores of stars needs nuclear fission to work. That's really just silly. First, he mentions scientific papers that are 40 years old or more saying there were problems understanding how stars can start fusion. But there has been considerable work done since then, and what was a problem in the 1960s isn't such a problem anymore. Also, uranium and other fissile materials are created when stars explode, so the first generation of stars at the very least didn't have fission to help their fusion. He tries to circumvent this argument by saying, basically, the Universe is a mysterious place, but that's just hand waving. I could just as easily say I might turn into antimatter tomorrow, and if you object, I could say the same thing he did. It's a cop-out for someone who has what is really just a silly theory. My first thought about having the core of the Earth be a nuclear reactor was, "where are the neutrinos?". They are a natural byproduct of fission, and if the Earth were such a big reactor, as he claims, they should be pouring out of the core. This was asked of him in those letters to the editor, and he again cops out and says we wouldn't detect them due to the noise from the Sun and reactors on the Earth. That's silly again; we know just how many neutrinos come from the Sun, and a source the size of the Earth just a few thousand kilometers down would be pretty obvious. I checked his website, and his main page has lots of errors as well (he says Jupiter's heat comes from nuclear energy; the mainstream thought that it comes from gravitational contraction must be wrong because "Jupiter is 98% hydrogen and helium, both of which are extremely efficient heat transfer media". Um, maybe at room temperature as gases, but what about under the tremendous pressure that exists deep in Jupiter's depths?). I often wonder why mainstream sources like Discover and others give these people such a pulpit without giving mainstream scientists a real chance to air out these theories. It's aggravating. Okay, I'm done. Here are some links to some good webpages that relate to the movie. The official movie site has the usual annoying flash animations and popups, but very few images from the movie. Metacritic's website, with links to many other reviews of the movie. Dr. Darkmatter's page on the formation of the Earth and Moon has lots of (terse) basic info on the interior structure of the Earth. The Internet Movie Database entry for "The Core"
Talk about the movie on my bulletin board!